Figure 7. Relative contribution of the metatarsal (black), PP (shaded), and MP (white) in the foot of didelphids and cheirogaleids. The values for rays II through V represent mean percentages of total ray length for each species. have shown strong similarities between Marmosa, Caluromys, and cheirogaleids in use of the extremities when grasping thin arboreal substrates or food objects. 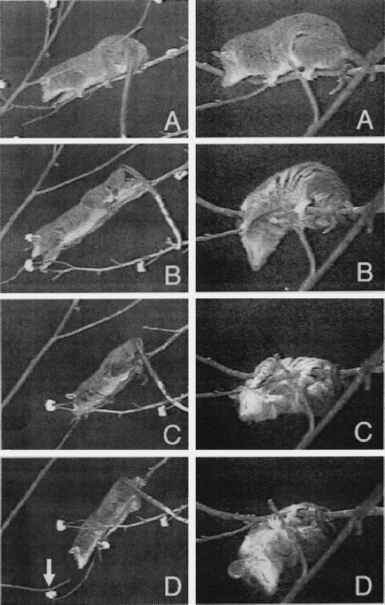 The comparison of Marmosa (Figure 18 in Charles-Dominique et al., 1981) with Microcebus (Figure 4 in Martin, 1972) or Caluromys with Mirza (Figure 2 in Lemelin, 1999) are striking examples of behavioral convergence between these primates and marsupials. What is still missing is a clear demonstration that more terrestrial didelphids with relatively shorter digits "perform" more poorly than Marmosa or Caluromys during locomotion and posture on thin arboreal supports. Performance studies provide a direct way to assess how the phenotype of an organism limits its ability to carry out behavioral tasks, and therefore provides crucial links between morphology, behavior, and ecology (Arnold, 1983; Emerson and Arnold, 1989; Wainwright, 1994). In this way, performance also aims to understand causal relationships between morphology and behavior, often employing an experimental approach (see next section for further discussion of this approach with regard to the origins of primate locomotor adaptations). We further tested the link between more prehensile extremities and fine-branch arborealism by examining in the laboratory the performance of two didelphid species moving on arboreal substrates of different size and orientation. Monodelphis domestica and Caluromys philander were chosen because they are well-differentiated in their substrate preferences (i.e., ground versus thin branches) and cheiridial proportions (i.e., relatively shortest versus relatively longest digits). Figure 8. Experimental trees used in the laboratory to examine locomotor and postural performance on thin branches between Monodelphis domestica and Caluromys philander. 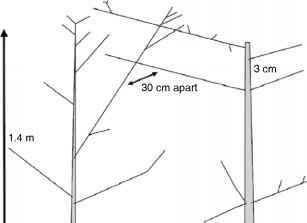 The height and diameters of the trunks, and distances between branches of the two trees are given in meters and centimeters. All the side branches are 1 cm in diameter or less. individuals of M. domestica (four males: 115, 122, 150, and 154 g, respectively) and two individuals of C. philander (two females: 392 g each) were released by hand one at a time on various portions of the tree setup. A subject was free to follow any path until it came down to the floor where it was captured and released on the setup again. Fruits were impaled at many secondary twigs to promote movement of the animals at the periphery where branches are thinnest and most flexible. Locomotion and posture for each animal was recorded (60 Hz) using a Super VHS Panasonic camera (Matsushita Electric Corp., Secaucus, NJ) resting on a tripod, and two halogen lights were utilized, so the camera could be electronically shuttered (1/1000 s) to avoid motion blur. The behavioral data were analyzed by viewing the videotapes on a JVC videocassette recorder (JVC Professional Products Co., Wayne, NJ) using the frame-by-frame option. The most stunning result of our performance study was the clear indication that Monodelphis had difficulty keeping its balance when moving on thin and flexible branches (less than 1 cm in diameter). In most of the 45 trials for which Monodelphis subjects were released on these thin supports, three out of four individuals examined rolled sideways and ended up upside down as soon as they began to move quadrupedally (Figure 9). All the subjects fell at least once from the setup, for a total of nine falls. In most cases, the animals moved back toward the trunk and descended headfirst in a clumsy, deliberate manner until the relative safety of the ground was reached. Only the smallest male (116 g) was able to walk quadrupedally on thin branches, sometimes all the way to the periphery of the tree setup. The same animal showed also more prowess climbing up and down, and performing suspension by the hindlimbs and bridging between trees. However, it is important to note that while moving quadrupedally on thin branches, this individual often rolled sideways and ended up upside down, as observed in the other animals. In this context, Pridmore (1994) reported in his laboratory study of opossum gaits that Monodelphis appeared unstable and frequently fell when walking quadrupedally on 6.3 mm poles. Figure 9. Comparison of the locomotor and grasping abilities of Caluromys philander (left) and Monodelphis domestica (right) while moving quadrupedally on the same thin branch (less than 1 cm in diameter). The sequence on the left shows a woolly opossum able to stay balanced on the top of the pliant support (A, B, and C) as it moves towards the periphery to reach the food treat indicated by the arrow (D). The a branch with the forelimbs, often in an acrobatic manner. On securing that branch with the forelimbs, the hindlimbs were transferred sequentially to that secured support. Hindlimb suspension (with or without assistance from the tail) and upside-down quadrupedalism were also commonly observed. In essence, the positional behavior and athletic abilities of the woolly opossum observed in the laboratory were very similar to those observed in the wild (Rasmussen, personal communication). This performance study establishes an important fact with regard to the evolution of grasping hands and feet in primates. A marsupial with relatively longer digits (i.e., more prehensile extremities) like the woolly opossum can negotiate thin and flexible branches more efficiently—in spite of its larger body mass—than the smaller, short-tailed opossum with relatively shorter digits (i.e., less prehensile extremities). These clear differences in locomotor abilities between Monodelphis and Caluromys strongly suggest that relatively long digits are useful to counteract undesirable torques that have the tendency to roll the animal sideways when walking on relatively slender supports. A causal link can thus be established between more primate-like cheiridia with greater prehensile capabilities and locomotor competence on thin branches. Such causal link between morphology and behavior can only be established with an experimental approach. In the following section, we present the results of a study that test the functional link between locomotor characteristics unique to primates and fine-branch arborealism using an experimental approach.